FILE - South African police provide security as Parliament workers, rear, protest against low wages in Cape Town, South Africa, Nov. 11, 2015. 2015 was, by all accounts, an intense year on South Africa’s political scene. The year kicked off with an actual brawl in Parliament, in February, after opposition members yelled at the president, prompting the speaker to call in parliamentary police. And it went downhill from there, as scandals of every possible variety hit the beleaguered president and culminated in a rash of end-of-year marches calling for Jacob Zuma’s removal. In the last 12 months, his critics have protested — among other things — his alleged misuse of government funds, his refusal to arrest Sudan’s visiting president on an international war crimes warrant and his sudden, little-explained recent decision to fire and hire three different finance ministers in one week. FILE - Demonstrators take part in a protest march across the Nelson Mandela bridge into Johannesburg, Dec. 16, 2015. 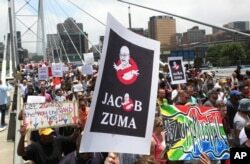 Protesters were calling for President Jacob Zuma to be removed amid allegations of corruption. And, analysts say, if you thought that was dramatic, 2016 is going to be even more significant, when all of these issues get thrown into what is usually seen as a boring but necessary fixture of democracy: local elections. This year, unlike any other, South Africa’s midyear local elections, in which voters choose partisan candidates for local councils, are likely to serve as a proxy war for the nation’s bigger political battles — and have huge consequences for the next round of national elections in 2019. The local elections will be held over an extended period between May and August. Political analyst Ralph Mathekga said the ruling African National Congress —which swept into power during the nation’s first all-race democratic elections in 1994 — has seen a 3 percent drop in every election, which is partly attributed to changing voter sentiment, but also to the growth of opposition parties, which give voters more options. And, he said, opposition parties have increasingly realized the potential of local government as a springboard to power. The opposition Democratic Alliance proved that was possible when they won the city of Cape Town in the 2000 elections, and then later, the entire Western Cape Province. This year, they and the far-left Economic Freedom Fighters are eyeing the nation’s other major cities, where urban, educated voters are exacerbating the ANC’s decline. The enormous gold seam that ran below the streets of the nation’s economic hub is mostly gone, but has been since replaced by the nation’s stock exchange, the headquarters of multinational mining giants and the nation’s top decision makers. Mathekga said he’s eagerly watching Johannesburg. The ANC lost a whopping 10 percent of its hold on the province of Gauteng — which contains Johannesburg and Tshwane — in 2014’s national elections, to win by a narrow 55 percent. The opposition Democratic Alliance picked up a lot of that poll share, surging from nearly 22 percent to just under 29 percent. “If you lose the city of Johannesburg, you cannot legitimately claim to run the country,” he said. FILE - A student holds a placard during their protest against university tuition hikes outside the ruling party African National Congress (ANC) headquarters in Johannesburg, South Africa, Oct. 22, 2015. Joy Coplan is an ANC councillor for a wealthy Johannesburg ward, and said she’s seeing the party lose ground right before her eyes. Her appointment exemplifies this: she was put in the post by the ANC through South Africa’s proportional representation system, in which voters cast a ballot both for an individual candidate and, separately, for a party. The individual actually elected to her ward is from the DA; they work in parallel. She said her two terms have been fulfilling — though she isn’t running again for personal reasons — but that she knows voters in her area have turned away from the ANC. “In the suburbs I work in, it is a DA stronghold and ... we might increase our figures from previous, but we would not be able to overcome the DA majority,” she said. She blames the scourge that South Africa has never really been able to shake: racism. To illustrate, she said, Johannesburg’s ANC mayor is pushing for densification of the city’s wealthier neighborhoods, a move that will bring in cheaper housing, and therefore, may usher in more racial diversity. Her constituents are largely opposed to the idea — and therefore, to the ANC. Former Johannesburg ward councilor Darren Bergman, now a DA member of parliament, disagrees. He said that South Africans are upset at the ANC mainly because of failures at the local level — the nation has for years struggled to provide regular electricity, water and basic services to everyone. FILE - A view of electrical poles and wires at a suburb, with Table Mountain in backdrop, near the city of Cape Town, South Africa, Sept. 27, 2013. He said he still looks back fondly on his two years as a councilor in one of Johannesburg’s largest — and poorest — wards. It was in that job, he said, that he really had the chance to change people’s lives. Mathekga, the analyst, said this year is the start of a major political shift in South Africa towards local government. He predicts, however, that this scramble for local seats may bring in some instability if the fractious parties have to form local government coalitions — but said it’s ultimately good for the country.